Do you love working on big vehicles? Do you dream of being able to repair even the biggest buses, trucks, and heavy machinery? If so, you might be well-suited to be a diesel mechanic. Diesel mechanics can find work in a variety of industries as there are many types of vehicles and machinery that use diesel engines. Keep reading to find out more about becoming a diesel mechanic. A diesel mechanic inspects and repairs various vehicles that have diesel engines. This can include trucks, buses, and construction machines. Keep in mind that these duties will vary depending on the industry you’re working in, the type of vehicle you’re working on, and your employer. In the United States, the average salary of a diesel mechanic is about $53,000. Most diesel mechanics earn between $45,000 to $58,000 per year. No matter what industry you’re considering, the best way to make the most money as a diesel mechanic is to get plenty of education, both before and after you start working. Another option to earn more money is to be self-employed. This comes with the additional challenges of running your own business and finding your own clients, but it may be worth it. Before you jump into pursuing a career as a diesel mechanic, you need to make sure it’s one you’re going to love. Training and education to become a diesel mechanic takes time and work, so you want to know for sure you’re ready for the challenge before you get started. If possible, spend time with diesel mechanics and ask them about their experiences to get a better idea if this is something you can see yourself doing for the rest of your life. Whether you graduate from high school or opt to get your GED, graduating from high school is the first and most important step to becoming a diesel mechanic. To truly set yourself up for success, attend a technical school where you can take mechanic classes while in high school. Many regular high schools also offer classes in auto repair. If that’s an option for you, be sure to take them to learn as much as you can as early as possible. There are two options for pursuing higher education to become a diesel mechanic: a certificate program or an associate’s degree. We’ll discuss these educational options in more detail later. Whichever you choose, there are likely a few schools in your area that offer programs to get what you need to become a diesel mechanic. A CDL is a Commercial Driver’s License. It’s necessary for operating buses, trucks, and other types of heavy machinery that you will be working on as a diesel mechanic. 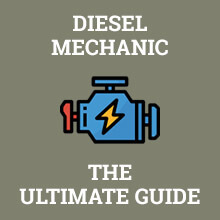 To properly diagnose and repair diesel engines, you need to be able to operate them. Besides that, you will have a difficult time finding a job without a CDL. This is also something that you can do while taking classes, but it requires taking an exam so it may be hard if you have a heavy class load. If you’re lucky, you can find a job before completing your education. This would be a great way to get the experience you need while still attending a program. Otherwise, you’ll want to start looking for a job shortly before you graduate. If possible, find a job within the industry you want to work in, even if it’s not the exact job you want. Once you have the appropriate amount of work experience, you can take a certification exam through the National Institute for Automotive Service Excellence (ASE). There are a number of certifications available that will help you demonstrate an area of expertise. Getting certified will help you earn more money and get a job in a specialty area of your choice. For more information on licensing and certifications, keep reading; we’ll go into more details later. The best thing you can do for your career as a diesel mechanic is to keep taking certification exams until you reach master status. It will take time and effort, but the pay raise and increased opportunities make it worth it. The auto industry is always changing, so keeping up on the latest advances in diesel engine technology will make you a valuable member of any mechanic team. As previously mentioned, there are two main education options to become a diesel mechanic. The first is earning a diesel mechanic certificate. 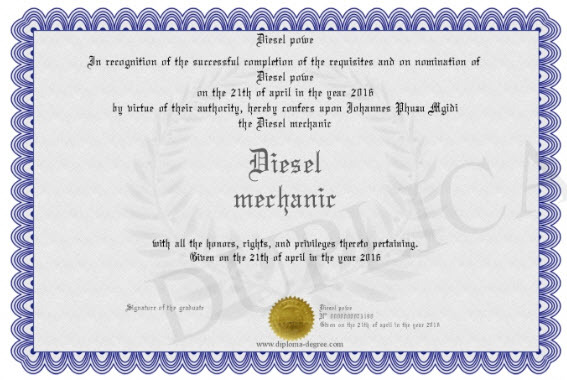 A certificate program is generally short and focuses only on what you need to know to perform the job of a diesel mechanic. The program can take as little as 6 months to complete. This is ideal for someone that wants to start working as soon as possible. However, it may not offer many opportunities to expand your knowledge beyond diesel engine repair. An associate’s degree is the other option. This degree is more well-rounded and typically takes 2 years to complete. This is a good option for someone that wants to learn more than just what’s necessary and who wants to broaden their area of expertise. An associate’s degree program will also include classes on math, science, and more. For someone that wants to run their own business, an associate’s in diesel engine mechanics is a good place to start. From there, you may want to enroll in business classes while working as a mechanic so you can be ready to start your own business. Some people become diesel mechanics without pursuing any education. They get on-the-job training and some do quite well for themselves. However, today it may be difficult to find a well-paying job without any type of educational background. The problem is that when a shop has to spend their time training you, they’re not going to pay you as much. You’ll start out at a lower salary, and may have trouble proving to them that you’re worth more than your starting pay once you’re fully trained. That being said, working as a diesel mechanic while attending a college program is another popular option. This way, you’ll get both the training and the experience needed to get your certification shortly after completing a program. As previously mentioned, there are many certifications to choose from to be a diesel mechanic. The number of tests you need to take to get a master certification in each of these ranges from 3 to 8. Additionally, hands-on work experience is required for each level of certification. If you’re interested in a particular field, then you’ll want to do additional research to find out more about the requirements for that certification. You can also take practice tests as part of your study time before the certification exams. Once you’re ready, you’ll be expected to pay $41 per exam you’re taking and $36 for registration. These certifications expire every 5 years. At that point, you’ll need to take a recertification exam for each level. The recertification exams are about half the length of the original exam and cost the same. If you let your certification expire, then you can get it back as soon as you pass the recertification exams; there’s no need to take the original exams again once you’ve passed them. To take the certification or recertification exams, you’ll need to go to one of the exam centers. There are over 450 exam centers throughout the United States so you can easily find one that’s close to you. The exam times are during weekends and evenings so there’s no need to take time off to go to your exams. When it comes to licensing, there’s no license to be a diesel mechanic except for your CDL driver’s license. To earn your CDL, you need to check with your state’s Department of Motor Vehicles (DMV) to find out their requirements. In most cases, you’ll need to pass a written test, put in a certain number of hours with a learner’s permit, and then take a practical exam. According to the U.S. Bureau of Labor Statistics, diesel mechanic jobs are expected to grow by about 9% from 2016 to 2026. This is about average for all occupations. The steady growth is contributed primarily to the increased need for shipping goods using diesel trucks. Additionally, there has been an increased interest in cars with diesel engines which will also drive a need for more diesel mechanics. Despite this job growth, it’s estimated that those with the best chances of securing a job will be individuals who have training before entering the job market. Following those will be people with a high school degree that are seeking on-the-job training. This is because individuals that already have the knowledge needed to begin work require significantly less supervision and are therefore an asset to a company from the beginning. That's a higher than average projected growth of 25,800 jobs. Should You Become a Diesel Mechanic? As with most jobs, the more passionate about what you’re doing, the more satisfied you’ll be with your job. Because of the many certifications available and the numerous industries that employ diesel mechanics, there are opportunities for advancement. When it comes to stress, being a diesel mechanic has an average level compared to other jobs. The stress level will depend greatly on where you work. Flexibility is an area where being a diesel mechanic falls below average. Many mechanics may find themselves working evenings and weekends because of needing to complete repairs within a certain timeframe. As of July 31, 2018, the average salary of a diesel mechanic is $52,981. From 2016 to 2026, there will be an estimated 25,800 additional positions available for diesel mechanics. Although the growth is average across all occupations, this is good news for anyone wanting to become a diesel mechanic. It also means that if you want a higher-paid position and additional job security, you’ll need to seek out education and certification opportunities. This is because there are people that enter this field with only a high school diploma. However, employers prefer hiring diesel mechanics that already have training. The minimum amount of education needed to become a diesel mechanic is a high school diploma. However, if you want a better job from the start, you’ll need to get higher education. A certificate from a technical college can take as little as 6 months. An associate’s degree will take around 2 years to complete. Additionally, it’s recommended that you get certifications through ASE once you’ve gotten some training and experience. These certifications only require that you take an exam so you can take them as soon as you feel ready. Additionally, you’ll want to be driven to further your education so you can gain more certifications to help you advance your career as a diesel mechanic. Q. How long do you have to go to school to become a diesel mechanic? Although the minimum requirement is technically a high school diploma, it’s far better to pursue a certification or an associate’s degree from a college or university. Typically, a certification program can be completed within 6 months. An associate’s degree takes 2 years on average. If you’ve already had some college courses, this could take even less time to complete. Generally, those who spend more time getting an education to be a diesel mechanic are able to earn more money at an entry-level position compared to those without formal education. Q. How much money does a diesel mechanic make a year? This depends greatly on what industry a diesel mechanic works in. A small engine mechanic, however, may only make $35,990. On the other end of the scale, a diesel mechanic working in the gas and oil industry could make up to $68,480 per year. Salary is also determined by years of experience and certification level. A certified master diesel mechanic will make more money than someone in the same position who has just graduated from high school. Q. What kind of education do you need to be a diesel mechanic? While hands-on training is a vital part of becoming a diesel mechanic, it’s best to get a degree from a trade school or college to have better overall knowledge of the job. Education can start in high school with auto mechanic classes, and then can continue up to an associate’s degree at an accredited college. In between those two is a certificate which is offered by trade schools. While pursuing a degree or certificate, you will encounter a great deal of hands-on training. You may also consider getting an entry-level position while getting an education to get even more hands-on training before becoming certified through ASE. Q. Are diesel mechanics in high demand? While there isn’t an extremely high demand for diesel mechanics, the demand for this job is expected to continue growing at a rate of around 9%. As long as there are oil, gas, shipping, construction, and auto industries, there will be a need for diesel mechanics. Diesel engines power everything from small cars to massive oil-mining rigs. Individuals and companies need diesel mechanics to keep these engines running smoothly. Q. What skills do you need to have to be a diesel mechanic? While the most important skill is the ability to maintain and repair engines, there are a few other skills needed to be a diesel mechanic. If you’re lacking in any of these skills, that doesn’t necessarily mean you can’t be a diesel mechanic. Start honing those skills now to make sure that you’ll be able to confidently say that you have them when you start looking for your first job. I am a general body mechanic and I was looking into being certified as a diesel mechanic because I heard they make more. I am glad I found this page. It has confirmed that I would be making around $15k more a year, possibly more. I will look into getting this done over the summer. Thanks for the information! My grandfather was a diesel mechanic and when he retired, he was making about 60k yearly. That was nearly 20 years ago. I would imagine if you start now, you can hit nearly 100k yearly by the time you retire if the demand stays the way it is. If it is a passion for anyone out there, go for it! I am a diploma holder of auto mechanic diesel and petrol, please help me find a job.